1) Despite us all having taught the songs in the video SO MANY TIMES in the last year… they are still like a strange addiction; kind of like those sour key candies that make you pucker and yet you can’t stop eating them. 2) I would never steal someone else’s piano students… but these kids do tempt me. Teasing. Only sort of. You simply MUST watch this video if you like to smile. Obviously this family is not the norm… I mean… who gets along with their siblings well enough to practice that much. But it did remind me of the powerful role that siblings can play in piano practice… and how we as piano teachers can capitalize on that power to create lovely “home practice” memories. It’s likely that your piano students have siblings. And it’s likely that your piano students have siblings who also take piano lessons. But even if they are the only pianist in the family, including siblings in home practice activities can have a lot of benefits. Here’s why… and how! 1. Buddy Practice Is Beneficial – Not only do piano students often practice alone, but they often practice alone with their backs to everything that’s going on around them! Grabbing a buddy to spend time with at the piano is one way of kicking the loneliness factor to the curb. Plus… one of the most effective ways of learning a concept is to teach it to someone else! The handiest of “buddies” during home practice is likely a brother or sister… they’re always there whether desired or not. How can piano teachers capitalize on this? Make a point of sending home a simple “Teach Your Buddy” activity every few weeks where your student is asked to sit down with a brother or sister and be the teacher. 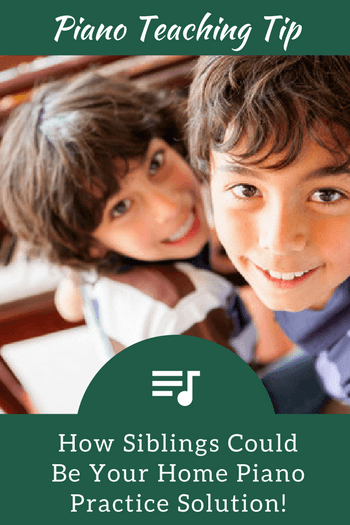 Even if your students are well beyond preliminary piano level, they can have a lot of fun teaching their siblings to play simple songs or understand simple concepts. Plus, they’ll be strengthening their own understanding, learning different ways of thinking about concepts and honing their own teaching skills! 2. Family Music-Making Is Memorable – Family Music-Making doesn’t need to be a structured activity. It can be as simple as giving a sibling a tambourine and a steady rhythmic pattern to copy while your students play the piano. Does a sister play the guitar? Then quickly write simple guitar chords above your piano students’ music and ask them to play together at home. Most method books include words to pieces… so highlight them and ask a brother to sing along. Making a small effort to include siblings in your piano students’ practice time is well worth your time. Bonding on the bench is one of the most effective ways of strengthening a connection to the piano. Plus… do you think a parent is ever going to discontinue piano lessons after they see their beloved DNA all making music together? Answer? NOT A CHANCE !! 3. Music Calms The Savage Beast – Some of you may be thinking “This sounds like a recipe for disaster… If I had asked my brother to sing along it would have been WW3 on the bench” but in reality, music naturally brings people together. Even the most squabbly of siblings can find equal ground around music, and this means they will be more apt to gravitate towards those happy times at the piano… which means more practice time and happy piano teachers! How to Create Peaceful Practice… And End Practice Wars for Good!